* Senior club appearances and goals counted for the domestic league only and correct as of 22:12, 4 December 2016 (UTC). Nathaniel Edwin Clyne (born 5 April 1991) is an English professional footballer who plays as a right-back for Premier League club Liverpool and the England national team. Clyne was born in Stockwell, London. He made his first-team debut for Crystal Palace in a 3–0 Championship win against Barnsley at Selhurst Park on 18 October 2008. He signed a three-year professional contract with the club two days later, with manager Neil Warnock stating that Clyne "has a bright future in the game". His first career goal came on 8 December 2009, when he opened a 4–2 win at Reading in the seventh minute. In February 2010 he was offered a move to Premier League side Wolverhampton Wanderers, but rejected it without even entering talks with manager Mick McCarthy. 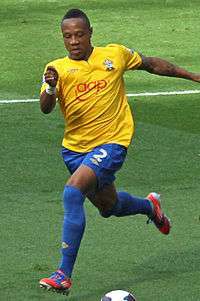 In the 2010–11 season, Clyne was the youngest player in the Football League to play every single game of that campaign, and won Crystal Palace's Player of the Year award. 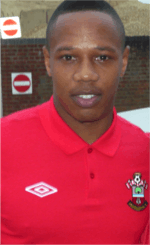 On 19 July 2012, Clyne signed a four-year deal with newly promoted Premier League side Southampton. He made his debut on 19 August, in a 3–2 defeat against Manchester City at the City of Manchester Stadium. His first game at St Mary's came six days later in a 0–2 defeat to Wigan Athletic. He scored his first goal for the club on 22 September, in a 4–1 win at home against Aston Villa, set up by Gastón Ramírez with England under-21 coach Stuart Pearce in attendance at St Mary's. His second goal for the club came in the FA Cup third round against Burnley on 4 January 2014, opening an eventual 4–3 home victory with a 25-yard strike past Tom Heaton. Clyne scored in Southampton's first game of the 2014–15 season, a 2–1 defeat against Liverpool at Anfield on 17 August. He scored his second goal of the campaign on 23 September, with a long-range effort which gave Southampton a 2–1 victory at Arsenal in the League Cup third round. On 24 November, he finished Ryan Bertrand's 81st-minute cross to earn a 1–1 draw away to Aston Villa. On 1 July 2015, Liverpool confirmed the signing of Clyne from Southampton for £12.5 million on a five-year contract, with his former club, Crystal Palace receiving a payment of £2.5m. Clyne made his debut in a Liverpool shirt against the True Thai Premier League All Stars in Bangkok on 14 July as part of the club's pre-season tour. He made his competitive debut on 10 August in a 1–0 away win against Stoke City in the first match of the 2015–16 Premier League season. On 8 October 2015, Clyne scored his first Liverpool goal in a 1–0 League Cup fourth round victory over Bournemouth; the team's first win under Jürgen Klopp. His first league goal came on the 14 February, in a 6–0 win at Aston Villa. In March 2016, in Liverpool's first European games against rivals Manchester United, Clyne won a penalty that Daniel Sturridge converted in the first leg, and conceded a penalty scored by Anthony Martial in the second, as Liverpool won 3–1 on aggregate in the last 16 of the UEFA Europa League. On 18 May, he played the full 90 minutes in the final, a 3–1 loss to Sevilla in Basel. On 2 October 2014, Clyne was named in the England squad for the UEFA Euro 2016 qualifiers against San Marino and Estonia later that month. He was an unused substitute in both matches. Clyne said "My aim, now, is to try to make myself first choice for Euro 2016. That’s what I’m going to keep pushing for." On 15 November, he made his full international debut in a home qualifier against Slovenia, playing the full 90 minutes of a 3–1 victory. Clyne went on to establish himself as first choice right-back for England, appearing in five of their last six qualifiers. 1 2 3 4 Hugman, Barry J., ed. (2010). The PFA Footballers' Who's Who 2010–11. Edinburgh: Mainstream Publishing. p. 87. ISBN 978-1-84596-601-0. ↑ Fifield, Dominic (7 October 2014). "The Brixton volunteers who made Nathaniel Clyne an England player". The Guardian. Retrieved 27 November 2014. ↑ "Crystal Palace 3–0 Barnsley". BBC Sport. 18 October 2008. Retrieved 19 May 2010. ↑ "3-year deal for defender". Croydon advertiser. ↑ "Neil Warnock Statement". Croydon advertiser. ↑ "Reading 2–4 Crystal Palace" BBC Sport. 8 December 2009. Retrieved 4 January 2014. ↑ "Clyne snubs Wolves move". Sky Sports. 1 February 2010. Retrieved 19 July 2012. ↑ "First Team Profiles: Nathaniel Clyne". Southampton F.C. Retrieved 2 October 2014. ↑ "CPFC Player of the Year – The History". Crystal Palace F.C. 6 May 2014. Retrieved 2 October 2014. ↑ "Saints Secure Clyne Deal". Southampton F.C. 19 July 2012. Archived from the original on 21 July 2012. Retrieved 1 July 2015. ↑ "Crystal Palace's Nathaniel Clyne seals Southampton move". BBC Sport. 19 July 2012. Retrieved 19 July 2012. ↑ Bevan, Chris (19 August 2012). "Man City 3–2 Southampton". BBC Sport. Retrieved 24 September 2014. ↑ Monaghan, Matt (25 August 2012). "Southampton 0–2 Wigan". BBC Sport. Retrieved 24 September 2014. ↑ Lewis, Aimee (22 September 2012). "Southampton 4–1 Aston Villa". BBC Sport. Retrieved 24 September 2014. ↑ Cryer, Andy (4 January 2014). "Southampton 4–3 Burnley". BBC Sport. Retrieved 24 September 2014. ↑ Ornstein, David (17 August 2014). "Liverpool 2–1 Southampton". BBC Sport. Retrieved 24 September 2014. ↑ "Arsenal 1–2 Southampton". BBC Sport. 23 September 2014. Retrieved 23 September 2014. ↑ "Nathaniel Clyne's goal allows Southampton to see off Arsenal". ESPN FC. 23 September 2014. Retrieved 23 September 2014. ↑ Rostance, Tom (24 November 2014). "Aston Villa 1-1 Southampton". BBC Sport. Retrieved 24 October 2015. ↑ "Liverpool sign Nathaniel Clyne". Liverpool F.C. Retrieved 1 July 2015. ↑ "Nathaniel Clyne: Liverpool sign defender in £12.5m deal". BBC Sport. 1 July 2015. Retrieved 1 July 2015. ↑ "Debuts, goals and a monsoon - Liverpool players react on twitter to Bangkok win". Liverpool F.C. 15 July 2015. Retrieved 6 August 2015. ↑ "Liverpool 1-0 Bournemouth". BBC Sport. 28 October 2015. Retrieved 28 October 2015. ↑ Sanghera, Mandeep (14 February 2016). "Aston Villa 0-6 Liverpool". BBC Sport. Retrieved 14 February 2016. ↑ McNulty, Phil (20 March 2016). "Liverpool 2-0 Manchester United". BBC Sport. Retrieved 20 March 2016. ↑ McNulty, Phil (17 March 2016). "Manchester United 1-1 Liverpool". BBC Sport. Retrieved 20 March 2016. ↑ "Sevilla make it three in row at Liverpool's expense". UEFA. 18 May 2016. Retrieved 1 June 2016. ↑ "England squad: Nathaniel Clyne and Jonjo Shelvey called up". BBC Sport. 2 October 2014. Retrieved 2 October 2014. ↑ "Nathaniel Clyne wants to make himself first choice right-back for England at Euro 2016". Daily Mirror. 11 November 2014. Retrieved 27 October 2015. ↑ McNulty, Phil (15 November 2014). "England 3–1 Slovenia". BBC Sport. Retrieved 15 November 2014. ↑ "Euro 2016: Who will make England's starting XI in France?". BBC Sport. 13 October 2015. Retrieved 27 October 2015. ↑ "Games played by Nathaniel Clyne in 2008/2009". Soccerbase. Centurycomm. Retrieved 25 August 2014. ↑ "Games played by Nathaniel Clyne in 2009/2010". Soccerbase. Centurycomm. Retrieved 25 August 2014. ↑ "Games played by Nathaniel Clyne in 2010/2011". Soccerbase. Centurycomm. Retrieved 25 August 2014. ↑ "Games played by Nathaniel Clyne in 2011/2012". Soccerbase. Centurycomm. Retrieved 25 August 2014. ↑ "Games played by Nathaniel Clyne in 2012/2013". Soccerbase. Centurycomm. Retrieved 25 August 2014. ↑ "Games played by Nathaniel Clyne in 2013/2014". Soccerbase. Centurycomm. Retrieved 25 August 2014. ↑ "Games played by Nathaniel Clyne in 2014/2015". Soccerbase. Centurycomm. Retrieved 1 April 2016. ↑ "Games played by Nathaniel Clyne in 2015/2016". Soccerbase. Centurycomm. Retrieved 6 September 2016. ↑ "Games played by Nathaniel Clyne in 2016/2017". Soccerbase. Centurycomm. Retrieved 18 September 2016. ↑ "Clyne, Nathaniel". National Football Teams. Retrieved 21 June 2016. ↑ "Spurs defender Kyle Walker wins PFA Young Player award". BBC Sport. 22 April 2012. Retrieved 23 April 2012. Wikimedia Commons has media related to Nathaniel Clyne.